﻿﻿Would you like to play real money online poker games on your tablet or phone? A growing number of poker rooms are developing software that lets you take your game on the road. The latest generation of poker apps let you play Texas Hold'em and Omaha cash games on iOS, Android, BlackBerry and Windows Phone. Some online poker sites have been more successful that other in creating an engaging mobile gaming experience for their players. 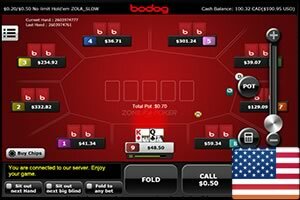 While many poker apps still only support Texas Hold'em ring games, more and more mobile poker rooms now also offer fast-fold games, Sit and Go's and Multi-Table tournaments. Our dedicated team of testers have put each of the major apps through their paces to find out which performs best on iPhone, Windows Phone, iPad or Android models from Samsung Galaxy, Xiaomi or Sony Xperia. Our reviews also contain detailed set-up instructions which make downloading and installing the mobile poker client quick and easy. 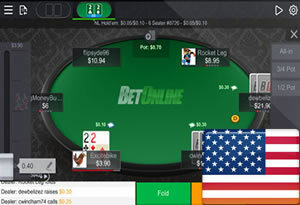 Poker players based in the U.S. can also find everything they need to know about legally playing real-money mobile poker in the United States. ﻿﻿﻿﻿﻿Sadly, Bovada have shut down their popular US online poker room but don't despair. All their players and their poker software has been transported over to Ignition Casino. Everything's the same apart from the logo. Play mobile poker in the US on ANY type of smarpthone. ﻿﻿﻿﻿﻿While Bovada only accept U.S. citizens, BetOnline welcome real money players from the U.S. and every other country on the planet. Their Android, iPhone and Windows Phone compatible app supports cash games, freerolls, SNG's and multi-tablet tournaments. All of the poker rooms featured in this section are compatible with the Apple iPhone and iPad. Download from the App Store or play from your Safari browser. The popularity of devices from Samsung Galaxy, LG, HTC and Google have made Android the most popular platform for playing real money poker. As Windows Phone grows in popularity, a growing number of poker sites have developed apps for Nokia Lumia and Microsoft handsets and tablets. New touchscreen models like the BlackBerry Z10 have meant that it is now possible to play Texas Hold'em at any of these BB compatible sites. United States poker players will soon have a brand new real poker app for real money games on iOS, Windows Phone or Android smartphones. Americas Cardroom Mobile supports tournaments and hold'em/omaha cash games. Different mobile poker rooms excel in different areas, however, there is a core group of features that every real money poker app should have. The aim of this guide is to help you find the ultimate mobile site for any Android, Windows Phone or iOS device.